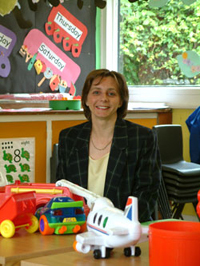 The Nursery staff work together to provide the very best in childcare. All staff are professionally trained and are DBS checked. We employ 32 members of childcare staff. Of these, 26 hold appropriate early years qualifications ranging from level 2 to level 6, and two staff members hold Early Years Professional status. We employ up to 5 childcare apprentices, who attend college for one day a week and work in the nursery for the remaining four days. We also have two domestic members of staff. We are very proud of our dedicated core team and most have been around for some time (in the nicest possible way that is!). We do not have a high turnover of staff and can usually provide some continuity of care in each of the main rooms. You can see photos of all the staff, including the cleaners, on the parent notice board in the main corridor. We aim to have the same members of staff working with the same groups of children all year round if possible. It is sometimes necessary to move staff around to maintain staffing ratios. We employ additional staff through Unitemps or other agencies. We try to use the same people whenever it is feasible to do so. In our most recent OFSTED Inspection (February 2016), the Inspector observed the quality of teaching. They assessed the impact this has on children's learning. The Inspector heard from parents and checked the suitability and qualifications of the staff. We were very pleased they [the inspector] noted how members of staff are highly motivated to extend their knowledge and skills and that the relationships between staff and children are excellent; as a result our children are confident learners, Debbie Castle, Nursery Manager.